A very dear (and possibly quite intoxicated) friend emailed me this afternoon with a link to Christopher Hitchens’ beautifully worded essay about his cancer diagnosis, saying it reminded him of my writing. While I am highly flattered, and definitely aspire to that level of proficiency (not to mention professional success), the essay did strike a number of chords. Hitchens speaks of the discovery of his illness as “…a very gentle and firm deportation, taking me from the country of the well across the stark frontier that marks off the land of malady.” This international one-way trip is the most shocking transition, especially for people (henceforth known as “patients”) who were previously healthy and unencumbered by medical interventions any greater than the occasional Advil. With diagnoses like ovarian cancer, what you think at first will be just a brief visit turns out to be a longer stay, with an extendable visa that might last the rest of your life. For the past few years, I’ve envisioned myself as I always was: a mom, wife, cook, fashion fiend, friend, sister — exercising, writing, cleaning, driving, living my life — who also happened to have cancer. This summer, however, the paradigm has shifted. Now I feel like I’m a cancer patient who also occasionally writes, walks the dog, folds laundry, and makes dinner. My treatment and attendant side effects have gotten more insistent, more interruptive. I have to have my daily meds, straight from refrigeration or a cooler, at the same time every day. Within three hours, I need to be near indoor plumbing. By mid-afternoon, I need a nap. Water tastes horrible, so I have to bring my own beverages. Comfy shoes. Short walks and a place to sit down. (I’m starting to sound like my grandmother. Who’s 103.) I can no longer be the same person I was in that other country. A part of me longs for the early stages of my illness again, that optimistic sense of purpose and determination, the adrenaline-charged vigor of the attack. Like a Saturday morning, the future was still hazy but full of potential; the fear of the unknown can be enervating but at least it’s a plan. Hitchens is starting chemo for his esophageal cancer, and I wish him health and strength to get through the journey. I miss the innocence and blind optimism and faith in medicine that carried me through that first summer with cancer. But the wisdom and perspective of the ensuing years I wouldn’t trade for anything. Okay, maybe a clean CT scan. Or a book deal. Hitchens? Throw me a bone, eh? Mr. Wonderful forwarded an article to me today – he’s good like that. Anyway, there was a study published in the Journal of the National Cancer Institute that says that symptoms are of little help in predicting whether a woman has ovarian cancer. 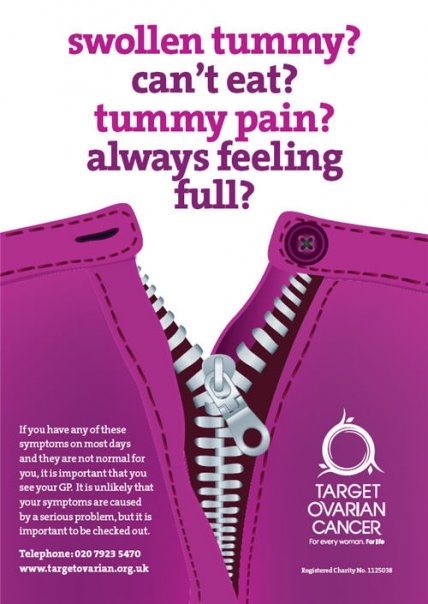 That is, out of 100 women with classic ovarian cancer symptoms (bloating, abdominal or pelvic pain, bowel changes or frequent urination), only one woman may actually end up presenting with the disease. “The low positive predictive value of symptoms to detect ovarian cancer—particularly at an early stage—argues for a cautious approach to the use of symptom patterns to trigger extensive medical evaluation for ovarian cancer,” the authors write. I read this news as very similar to that brouhaha about mammograms from last year: why bother testing, since it’s not going to come out positive? Not cost-effective, ladies; please hit the bricks. Yes, the editorial accompanying the study results highlights how great it is to discover that in fact all the women who have ovarian cancer do present with symptoms; and yes, they do say that this study’s results highlights the need for more effective markers and predictive testing for ovarian cancer. But with the state of health-care today (quick shout-out to Scott Brown: hey! ), don’t you just envision the suits over at Major Health “Care” Conglomerate, Inc. licking their lips and checking off another reason to deny a CA-125 or ultrasound or laparoscopy? More importantly, it’s hard enough for many women to get a doctor to believe that there’s something really wrong when they complain of any of these classic symptoms – I’ve read too many horror stories about doctors diagnosing stress, esophageal reflux, constipation, and prescribing some Ambien and Prilosec and sending the woman on her way with a pat on the head, like Cindy-Lou Who. If this gets out, how much harder will it be to impress upon someone the seriousness of the situation? And finally, perhaps the most frustrating part of this study is that, even with such “classic” symptoms for ovarian cancer, experienced by nearly EVERY woman who has the disease, early- or late-stage, THEY’RE SO POORLY PUBLICIZED. I’m a pretty well educated woman, I know how to take really good care of my body; why did I have no idea about the symptoms of ovarian cancer? There should be a poster up in every OB/GYN’s office waiting area and another one in the exam room, so while you’re waiting an hour and a half for your appointment you can read and re-read and memorize the symptoms and maybe have a chance at identifying them while you’re still save-able. That’d be way more useful than an eighteen-months old copy of Good Housekeeping. Once other people hear you have cancer, they unfailingly end every conversation by saying, “Let me know what I can do to help.” But at the time, you can never think of anything, and then when you think, “Wow, I wish I had someone to walk the dog tomorrow…” you can’t remember who it was who offered to help (chemo brain). How can something so generous turn out to be such a royal pain? Within about forty-eight hours of my surgery, my crack research team (read: family members with internet connections desperate to DO something) had located the best Gyn/Onc in the area for my case, researched the then-hot-and-trendy-new IP chemo protocol, sent Edible Arrangements, and hooked me up with a lifesaving website that would feature prominently in my treatment and recovery plans for the next three years (and may come around again). Lotsahelpinghands.com is a website that allows an administrator (you? your BFF?) to set up a free homepage for the cancer patient and their family, friends, and supporters, who log onto the site and sign up with a password once they are invited to join. The administrator sets up “tasks” – events as simple as picking up drycleaning or running to the grocery store, or as complicated as making a meal with specific dietary requirements (not too spicy, the kids don’t eat tomatoes, etc.) and bringing it over to your house. The sky’s the limit; my administrator set up “daily laugh” tasks so people would send me email jokes, and people from my then-kindergartner’s class signed up to host playdates for him and his little brother. I had people weeding my garden, raking leaves and planting mums in the fall, and delivering more delicious dinners than any one family could eat in a month of Sundays, except Mr. Wonderful was involved so we ate it all. The BEST thing about lotsahelpinghands (aside from it being free) is that it gives the overwhelmed family a way to pass off some of the crazy-lot of organizing that comes with the new regime. And the seemingly unceasing refrain of “How can I help?” has an easy outlet: sign up for the website and start taking on tasks. The OTHER best thing about lotsahelpinghands is that it taught me to let go a little and lean on others. My family is so self-reliant (and Mr. Wonderful and I slight control freaks) that allowing other people to take over and fold my laundry was nearly painful at the beginning. But as my kids and I got more used to giving up some control so we had more time to be together as a family (especially important when it seemed there might only be a couple more years) I realized that it was one of cancer’s silver linings. My boys learned the value of doing for others, and we now are honored to pay it forward whenever we get the chance. The sense of community may have been more instrumental in my survival than the chemo.